Sonographers play an important role in the lives of their patients. They’re with them as they hear their baby’s heart beat for the first time. They help the physicians diagnose and treat disease. And they provide support during what can be very emotional circumstances. An ultrasound technician, also referred to as a sonographer or diagnostic medical sonographer, does more than just operate imaging equipment. They balance patient interaction and technological performance with a firm knowledge of anatomy and pathology, working cohesively with a healthcare team. There are numerous medical imaging techniques used to diagnose and treat health disorders and abnormalities, including X-rays, MRIs (magnetic resonance imaging) and ultrasounds. Sonographers use imaging equipment that non-invasively emits sound waves directed towards internal organs, blood vessels, tissues and other structures. 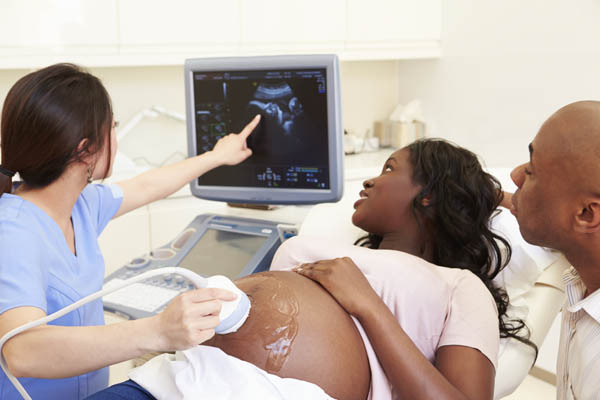 A sonographer’s job description entails using this specialized technology but can also include interpreting these images and assisting the rest of the healthcare team. The U.S. Bureau of Labor Statistics predicts that jobs for ultrasound technicians will increase by 17% by 2026, a rate which is considered much faster than average! Ultrasound technician job duties vary across specialties, from monitoring the development of a fetus in utero to evaluating the passage of blood throughout a patient’s vascular system. Some sonographers will also assist with interventional or minimally invasive procedures for either diagnostic or therapeutic purposes, from ultrasound-guided surgeries to biopsies. Ultrasound technicians differ from radiologic technicians who perform X-rays, MRIs and CT scans in that their equipment employs sound waves instead of radiation. While an ultrasound technician’s job description differs from that of other medical imaging professionals, their work often compliments one another. For example, a radiologic technician will often take a mammogram of the breast in conjunction with a sonographer performing an ultrasound. A sonographer’s job description varies depending on where they work. According to the Bureau of Labor Statistics (BLS), the majority of diagnostic medical sonographers worked in hospitals. In a hospital setting, 12 hour shifts are not uncommon, and a sonographer can expect an average of 12-15 patients in a day. Sonographers will work closely the healthcare team, receiving referrals from physicians and reporting any concerns back immediately. A sonographer must also possess certain values and abilities, including social perceptiveness, critical thinking, clear communication, active listening and patient problem sensitivity. The sonographer is responsible for performing all ultrasound procedures including those within the department, at the bedside, and in the OR. Works closely with the radiologist and other licensed physicians presenting images and data for interpretation and assisting with interventional procedures. Must show independent judgment when performing procedures and when addressing difficult or unusual situations. Responsible for evaluating images for technical quality. Utilizes PACS (picture archiving and communications system) with accuracy. Accepts additional assignments and tasks as needed for the department. Provide Ultrasound department coverage after hours participating in ‘ON-CALL’ rotation. Assess patient to determine ability to undergo requested examination. The field of medical imaging is constantly changing, with new technology bringing new opportunities. Here are just a couple of the emerging fields within diagnostic medical sonography. A number of ultrasound staffing agencies offer opportunities for sonographers to take their vocation on the road. Traveling ultrasound technicians generally work on short term contracts, filling in for sonographers who go on maternity or sick leave, vacation, or extended leaves of absence. It’s a great experience for ultrasound techs to see different parts of the country and a variety of workplaces. Reputable staffing agencies should cover travel, housing and per diem expenses, and traveling sonographers often earn more during their contract than they would working the same period as a permanent employee. Being flexible can have its benefits. To discover more about being a traveling sonographer, check out Stephanie Eisler’s The “Nanny McPhee” of Ultrasound Part 1 and Part 2, and our interview with President of SonoTemps Inc., Dave Felix. Telemedicine involves two or more healthcare professionals, who are in different geographic locales, sharing medical information via electronic or telecommunications. “Telemedicine includes a growing variety of applications and services using two-way video, email, smart phones, wireless tools and other forms of telecommunications technology,” states the American Telemedicine Association. Ultrasound technicians can play an important role in telemedicine. At a rural hospital or health centers, for example, there may be only limited times when a specialized physician, like a cardiologist or gastroenterologist, is actually on site. In these situations, sonographers and other medical imagers can work directly with patients at the facility and communicate their findings with the appropriate physician. “The benefits of telehealth were immediately apparent,” described AuntMinnie.com contributing writer, Doug Wuebben, about working as a pediatric echocardiographer in South Dakota. If you are interested in a career in sonography, numerous colleges and universities offer ultrasound degree programs that will provide you with the theory and practice (through labs and clinical internships) you need to be a successful ultrasound technician. Before applying for a program, ensure it will qualify to you to become certified through the ARDMS (American Registry for Diagnostic Medical Sonography), a credential heralded by the American and global medical community.